The Indian artist Shilpa Gupta (b. 1976) was born and educated in Mumbai, where she also lives and works. Having entered into global art market very early in her artistic career, she uses a global vocabulary is related to formal and conceptual vocabulary of Western Conceptual, Minimalist, and Relational art.1 Yet her use of local hand-made paper, fake Indian administrative forms, hand-woven fabrics, and local medicine, as well as the narratives embedded in her works, ground her practice in a South Asian context. Her aim is somewhat to foreground the preconceptions which we tend to project on our environment rather than engaging liberally with it. Many of her works confront essentialist and nationalist notions of identity in the context of the violence that predates intercommunity and family life in the Sub-continent. Her work is particularly concerned with the estrangement between India, Pakistan and Bangladesh, which is cultivated by nationalist governments. She works against essentialist notions of identity as defined by social and political forces: gendered and religious narratives, and the nation-state’s logic of territoriality. She offers an understanding of identity as multi-layered, having to do with the memories, subjectivities, and affects that daily activities and human encounters map onto the mind through the peripatetic movements of the body. Her interest in the complex fabric of Indian cities, which stems from the Sub-continent’s ancient history of trade, with Europe but also with the rest of Asia (China, Japan, Afghanistan, Iran etc. ), is combined with her determination to reveal the invisible bodies and wills that are the living pulse of these cities. Her works, which manifest and celebrate the subaltern lives of those cities, can be thought of in relation to the work of other Indian artists like Anwar Kanwar or Raqs Media Collective, which are infused with a Gandhian/Swadeshi politics of love and respect for these simple protagonists, in addition to being inflected with a Marxist agenda.2 While Kanwar’s works operate, in the words of art historian Geeta Kapur, as a form of “reparation” in that they “celebrate the courage and patience” of anonymous Indians who are victims of local predatory practices,3 Raqs Media Collective’s installations have a metonymic proximity to global trade in order to condemn it.4 Gupta’s works meander between these two poles as she presents the spectator with the effects of trade on a variety of people from India, Bangladesh, Pakistan through objects that are the bearers of affects, dry, apparently neutral material that taken from the realm of infrastructure (information panels, microphones, luminous sign posts). Thus the works are both more subjective and less located than Kapur or the Raqs Media Collective. While both the complexities of her personal background and the political aspects of her works fit with her generation’s concerns with metropolitan space and religious fundamentalism, this article will focus on works that are concerned with the subjectivity at the core of everyday life. 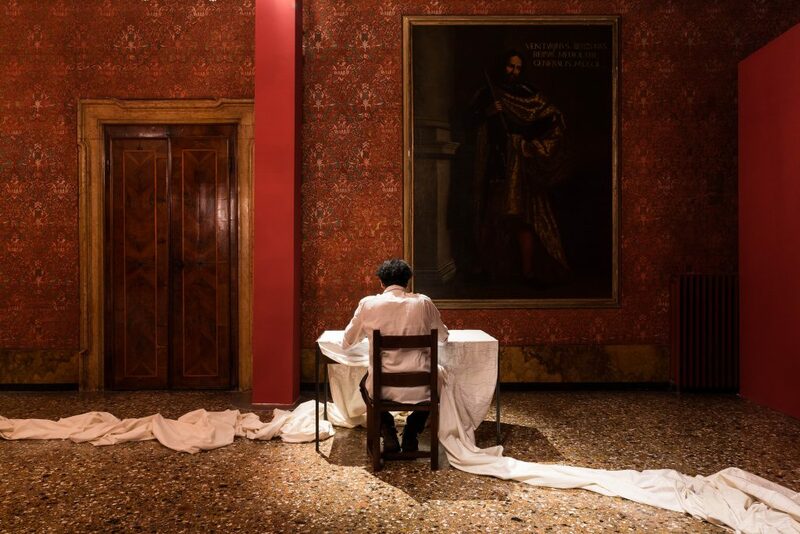 Looking at a set of works offering narratives of actual journeys in the city, between cities, but also between social norms and politics, it will analyze the interplay between language and the materials that convey it. Her works also incorporate frames, glass boxes, light boxes, and white walls, inducing in a Western viewer unaware of the peculiar circumstances of the stories, what I claim to be a meditative stance, a reflection on the poetic of the body/mind dialogue with space and time. 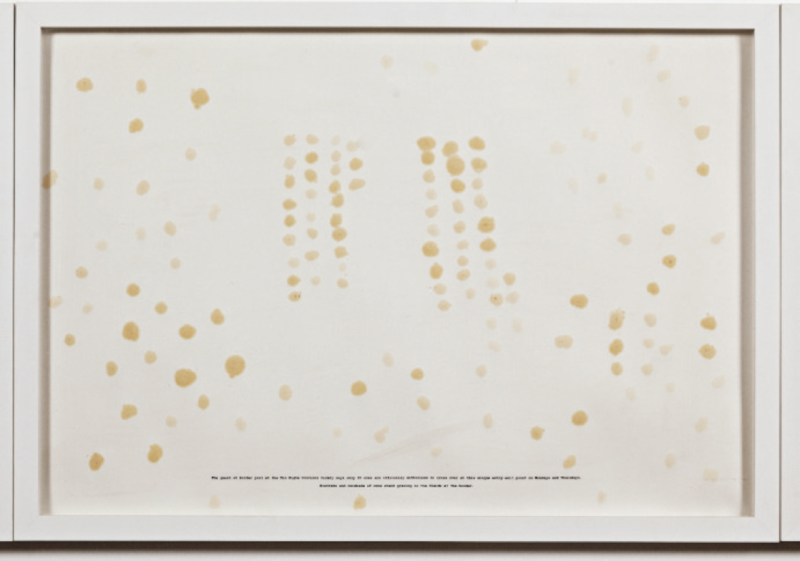 Using Irit Rogoff’s concept of “inhabitation,” Henri Lefebvre’s “rhythmanalysis,” and Michel de Certeau’s “practice of everyday life,” this article attempts to show that the sometimes vicarious, sometimes kinaesthetic encounter with the artworks communicates to the observer the subjective power of banal gestures, while the immateriality of the works embodies a form of invisible resistance to controlling forces. I also suggest that this body of work opens our reflection to an aesthetic of everyday life beyond the Marxist/anarchic paradigm of the “deterritoralisation of the globe”5 as a politics of resistance to global capitalism that underpins Irit Rogoff’s philosophy. I purport to link it to an “aesthetic of life” based on the concept of individual agency vis-à-vis coercive, political, economic and social forces, and to a dialogical relationship with the environment, which can be found in some western philosophers as well as in Asian aesthetics. Shilpa Gupta’s work is embedded in the life of Mumbai, a port city on the Arabian Sea that faces Pakistan. This megapolis of 22 million inhabitants, 19% of which are Muslims, combines slums with the most advanced Indian corporations’ headquarters, traditional family life with the cultural features of post-modernity.6 It is a showcase for the “glocal” era. Mirroring the city’s complexities, the artist describes herself as being interested in multiple, diverse, and intersectional identities. She is concerned with the threat to this complex fabric posed by the rapid globalization of India in the 1990s that pushed for the uniformity of tastes and lifestyle, and by the concomitant rise of the Bharatiya Janata Party that promotes India as a nation of Hindus, shattering the Nehru spirit of tolerance and secularity. A succession of violent episodes related to the rise of religious fundamentalism marked her youth: the destruction of the Babri mosque in Ayodhya, Uttar Pradesh, in December 1992 by Hindu extremists, and the bombings and riots that followed in Mumbai, in 1993.7 In 2001 the tensions between India and Pakistan over the contested area of Kargil in Kashmir led her to initiate a public art project called Aar Paar (“this or that,” but also “through and through”) with Lahore based artist Huma Mulji. They invited artists from both sides of the border to exchange works between Lahore and Mumbai, and later, posters were emailed and printed locally to create awareness of the point of view from the “other side.”8 It foregrounds the chasm even between artists, showing how entrenched territorial policies can be.9 Gupta created a poster called Blame which depicted a bottle full of red liquid with a label that read: “Blaming you makes me feel so good. So I blame you for what you cannot control; your religion, your nationality.” In 2002, Blame became an object and a performance in which she offered people commuting on local trains to take home an actual bottle, bearing said label and filled with an ambiguous red liquid. The bottles were received with disbelief, outright rejection, but also understanding by some who took a bottle with them. Her activity led to a verbal warning in regards to the “prevention of terrorism act.” On other occasions, people walked out of a restaurant where Aar Paar posters had been placed as table mats. The cheap paper and the lining up of the slabs reflect, according to the artist, the insensitivity of an administrative processing the victims of the conflict: “It refers to the act of filing, of measuring, of quantifying. Of defining people, place, everything! ‘You are part of this, you are not part of that.’”14 The iconic green paper on which the spectator may commit to being a caretaker, together with the seemingly careless setting of the installation (as during the exhibition After Midnight at the Queens Museum in New York)15 add to the quasi-invisibility to the whole piece: laid behind a barren wall, separated by a corridor from the main alley, and lined up as construction material in waiting, one could easily miss the slabs or could dismiss them as being insignificant.16 The green forms, casually placed on a neutral shelf, fail to attract much attention. 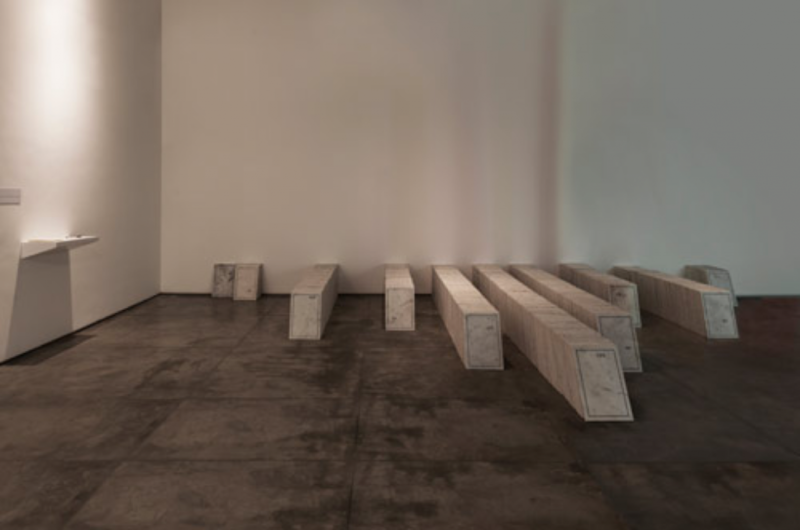 By organizing the chance encounter of the spectator with the makeshift forgotten graves through their perambulation within the exhibition space, the artist stages the way these objects and events present themselves in real life: without a red flag, while reading the news conveyed by the media apparatus. The title of the installation underpins this allegorical journey, evoking a walk along the National Highway N°1 that connects the capital city with areas “at the edge,” where violent actions are committed in the name of security. The invisibility of the crimes is underpinned by the lack of expressivity and affect of the material. It thus remains the responsibility of the spectator to decipher the signs in order to perceive the gravity of what is addressed. Drawing made with Phensedyl, codeine based syrup, 38 x 56 cm. Courtesy of the artist and Galleria Continua (San Gimignano, Beijing, Les Moulins, and Havana). Did grand mom come / from your side onto my side / to visit our mothers grave? The inspiration for Speaking Wall stems from a conversation with Pakistani filmmaker Farzad Nabi during an automobile trip in 2005, back to Lahore from Wagah, a frontier town where highly ritualised ceremonies of opening and closing of the border gate take place daily.60 Nabi mentioned a house on the Indian side of Punjab, a house his family owned prior to Partition and of which his grandmother has the keys till that day.61 The house, the keys, and the grave construct an imagined space that disrupts the official lines of separation. The border becomes a sacred space associated with the cult of ancestors, an actual Patria, a territory attached to a family lineage. The concept of rhythm here is essential: that of the steps with the sound, of the body with the wall, and the independent rhythm of the rain, that escapes boundaries. The installation foregrounds the distinct rhythms that pulse in each singular element. It organizes their encounter and produces a eurythmic harmony in place of arrhythmia, and thus a healing. This again suggests a proximity with Henri Lefevbre’s rhythmanalyst who “listens to the inside and outside of observed bodies,” sees them “as a whole” and attempts to “unify them…by integrating the inside and the outside” in order to produce a “eurythmia,” a “metastable equilibrium” where there were “disturbances (arrhythmia).”62 The imagination of the displacement along the border, in a house and a collective space of dwelling (of living and dying) is nurtured by the rhythm of physical movement instilled by the installation. It is itself the result of the interaction between the rhythm of the voice, the observer’s listening, and their bodily reaction. Because Shilpa Gupta’s work deals with displacement in a social realm, it is productive to read her works alongside Michel de Certeau concept of “anthropological space,”63 a “space as practice.” Certeau, a former Jesuit, ascribes spiritual dimension to inhabiting a space. It is a strategy of resistance by the anonymous, the overlooked individual. Using the allegory of a person shopping on the main street, Certeau suggests that each perambulation is unique and triggered not only by material constraints but also but affective and emotional needs (such as crossing the street after shopping at the butcher to say hello to the florist). This “walking…is indicative of a present appropriation of space by an ‘I.’”64 It produces a unique, performative mental image that reflects individual agency on the space the subject inhabits. This meandering characterizes the “relation to the world” of each individual, and as such “there are as many spaces as particular spatial experiences.”65 These subjective spaces are made manifest by first-person narratives which he calls “pedestrian speech act,” as when people describe their apartment from the point of view of their everyday experience of walking, from the corridor to a room, to another. They would use words related to vision such as “If you go straight ahead, you’ll see . . .” They use expressions related to a succession of actions (“There, there’s a door, you take the next one”) rather than a neutral description of the layout.66 This speech act, says Certeau, not only posits an “I” but also creates a sense of community as “it has the function of introducing an other in relation to this ‘I’ and of thus establishing a conjunctive and disjunctive articulation of places.”67 We find this exact same pattern in Gupta’s Speaking Wall, and it is striking that this installation originates from a conversation with Farzad Nabi, in which he conveyed his personal and familial memories of inhabitations, during a trip in a secluded space, a car. Shilpa’s installation acts as a transmitter of those memories to the spectator’s imagination through a body-mind experience. 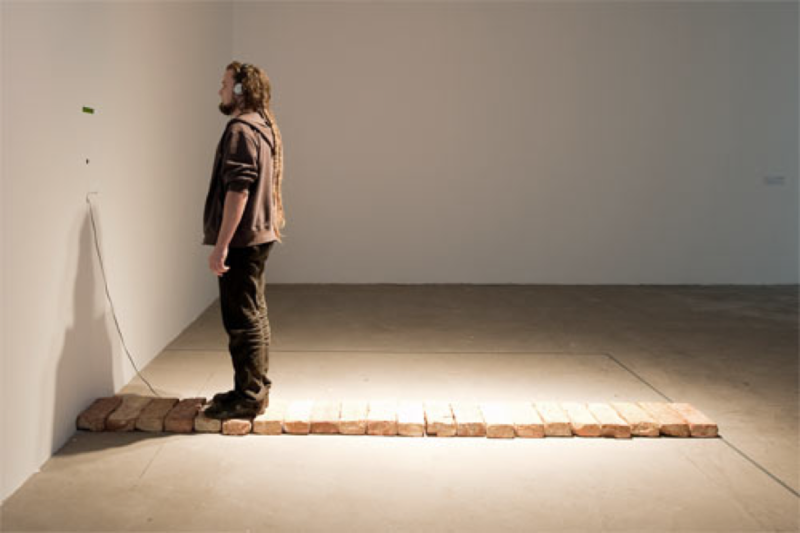 In that sense, the citation of Carl Andre’s Minimalist brick pathway—though overlooked by the artist—becomes meaningful, given Andre’s concern with walking and meditation. To Andre’s emphasis on inner thoughts, Gupta adds the function of communicating with an invisible community. 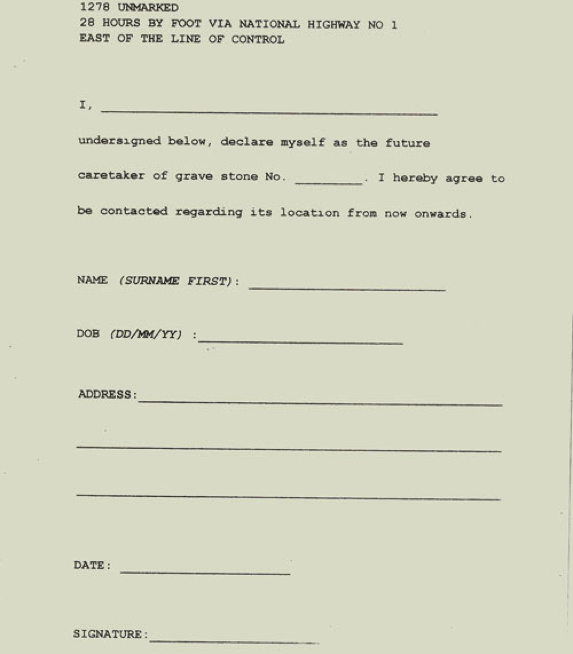 Referring to oracles, Certeau says that a story is first of all an authorization to undertake action that gives it a “foundation.” It is sacred as it ensures that action will be beneficial, auspicious.68 As a sacred act that ensures a favorable outcome, “a narrative activity, continues to develop where frontiers” and “the marking out of boundaries” are concerned.”69 Speaking Wall is certainly a narrative about a frontier, about Partition. It seems to point to the lack of an auspicious foundation in the creation of the frontier between India and Pakistan, and to the genocide and endless war that it entailed. It may be suggested that Gupta’s narratives, which blur and shift the frontier, redeem history by belatedly reconstructing a space in which graves are reunited with their caretakers, people with their houses, family members with their estranged land. Go straight. Turn right at the tea stall and carry on to the main road. Then after the church, you will see a Border Post pillar on your left. and you will see a shop selling wood. It’s the third house from the junction there. Carbon rubbings and incisions on paper, 45.72 x 68.60 cm. It can be claimed that these techniques of measurement based on the actual displacement of bodies (or vessels) disrupt the modern conception of maps, constructed by geographers away from the terrain, through astronomical calculations and today with satellite observations. This is what Shilpa Gupta attempts to do in 1703 km of Flood Lighting—Department of Border Management Home Ministry of India (2015-16) a work placed next to A Drawing made in the dark-1. (fig. 4) The former is made by creating a (fake) map of lightning posts along the border with Bangladesh. The artist used carbon paper and a crayon to create this map, puncturing the paper to create the lightning posts. She says, “I have always been interested in light—what we know and what we don’t. 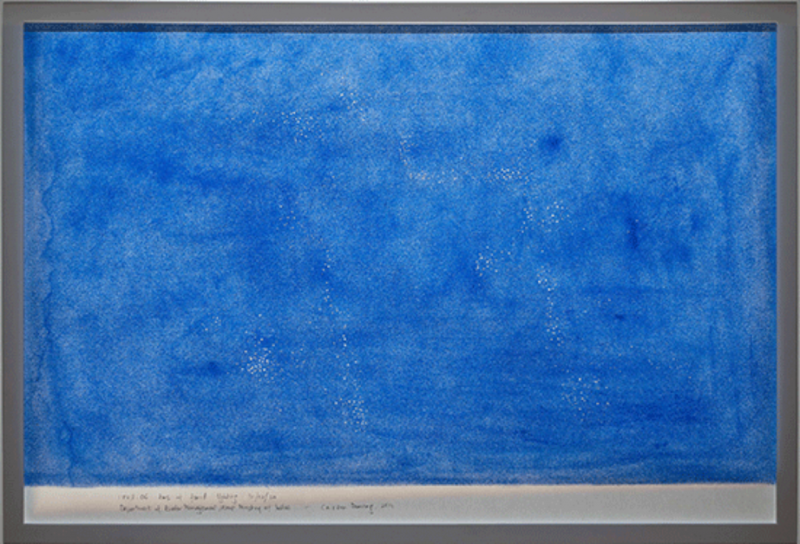 Here, carbon paper, which is used to duplicate something, to make a copy, often for keeping records, has been rubbed again and again on the paper, which is then punctured through.”73 The result is a mesmerizing work that seems made with a blue crayon. It irradiates a diffuse light, as if one was walking on this well lighted road, under the rain or in the fog. The tiny punctured holes reveal the white paper underneath, and glide like stars. It conveys a sense of uncertainty mixed with clarity, but also of threat, as when one approaches a border inundated with lights of control at night. The installation 1:998.9 (2015) (fig. 5 and 6), completes Gupta’s endeavors to rewrite borders metaphorically. 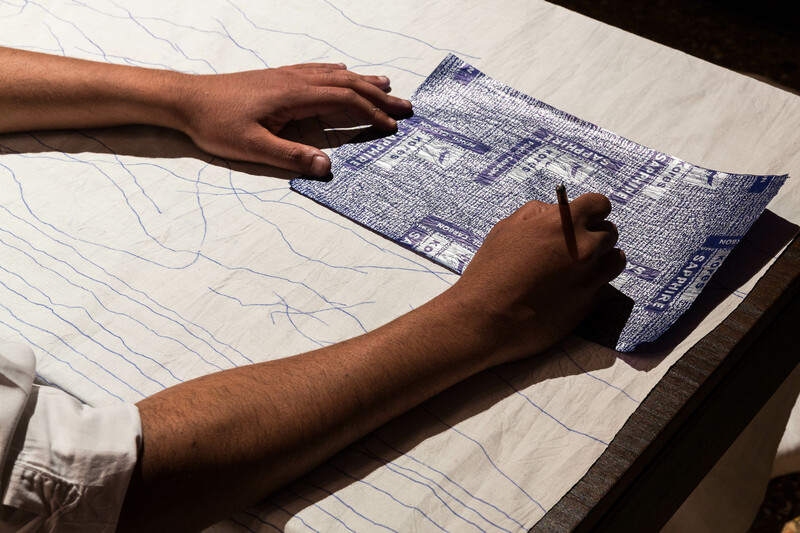 Upon entering the room, one sees a performer at a table drawing lines on a piece of hand-woven cloth, by pressing a stick on a carbon paper. On his left, lies as a massive, coiled white mass of fabric. The cloth comes from Phulia, a border town famous for its fine textiles. The man, who seems to be of South Asian origin, examines the tissue and draws on to it, making a succession of marks.74 He then shifts the fabric to the right by a few centimeters. It takes several weeks for the large heap of white fabric to be processed. The cloth is 3,394 meters long, a precise 1:998.9 of the length of the actual fence being built at the border between India and Bangladesh, which the artist claims is the longest security fence in the world between the two nation-states. This fence aims to protect India against terrorism and smuggling, but also creates a potentially lethal barrier for the population of the wetlands in the Bengal Delta who live in a volatile environment that is subject to the effects of climate change. fig. 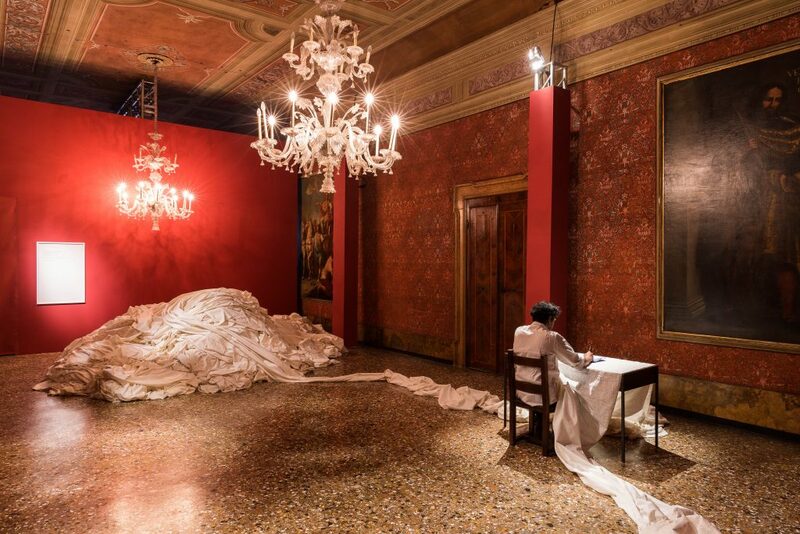 6 Shilpa Gupta, 1:998.9, 2015, Installation view of My East is your West, Palazzo Benzon, Venice, Italy, 2015. 1:998.9 appears as a metaphorical contestation of the barrier that, when finished in 2017, will limit the flow of people. It can also be perceived as the replay of the drawing of the border between the two countries, made hastily in July 1947 by the Radcliffe Commission under the stewardship of British officials. To a panoptic view of the territory, it opposes a repetitive, slow gesture made by a (fake) local, who draws lines according to his own inner rhythm. The work is not related to the Radcliffe Line, nor to a particular line, though: “They could be lines in your hands, lines on the ground, mountains, rivers, it could be map lines, lines of people walking routes, as in Drawing in the Dark; but always crisscrossing each other. It is related to a map, but mental as well as physical. It is quite indefinite and it has many meanings. It is a map line but not a map line, the things which are not on maps – which are also maps,” Gupta explains. The bizarre choice of scale, a little off from a rounded 1:1000, also “deals with a sense of inherent doubt with the large scale mapping exercises that get undertaken,” she adds.75 The work is a narrative of individual freedom and the right of any living being to disrupt officially sanctioned territory. To the utopia of the modern city and its rectangular grid of large avenues, Certeau opposes places “haunted by many different spirits hidden there in silence, spirits one can ‘invoke’ or not,” “the only places where people can live.”77 Similarly, Gupta’s arrangement of the exhibition space for My East is your West in Venice is a journey in the dark. Windows have been obliterated by shutters and fabric. There is but a dim light projected on singular works, forcing visitors to discover one artwork at a time, through a slow walk, and to somehow internalize the invisible journeys of the anonymous traders, smugglers and enclave settlers that are presented to their view. In this sense, Certeau’s text helps us see Shilpa’s works beyond the contingencies of the local, the historical and the political. At the core of this take on displacement is the celebration of individual agency. It appears that Gupta’s works contain a transnational narrative, in which frontiers are presented as arbitrary limits that create hatred, prejudice, and violence. They suggest that these prejudices can be overcome by a celebration of community-based identity, performed through the exchange of people and goods, ranging from basic medicine to expensive sarees, a process that Irit Rogoff has conceptualized as “inhabitation.” Yet, as traces of a subject-based displacement through space and time and of the inner reverberation, which they produce in the traveller’s mind, her works can be better understood through the notion of the “pedestrian speech act” coined by Michel de Certeau. Certeau and Lefevbre both point to the body-mind relationship as a process of asserting the “ordinary gestures” of the ordinary individual against social structures. While Certeau insists on an anthropological and metropolitan environment as well as on a relationship between the mind and the space, Lefevbre enlarges the frame to all “sensible” realms “everywhere where there is interaction between a place, a time and expenditure of energy.”82 While Certeau looks for the marking of one’s trace on the territory, implying a chasm between the subject and the space, Lefevbre advocates a search of “eurhythmy” between the individual body and its environment, not only an urban and social but also natural and animal, which is at the core of Gupta’s works. In recreating these inner spaces, speech acts and rhythms in her installations, as well as in allowing the visitor to explore them in a solitary way, through their own perambulation, Gupta produces an aesthetic experience in which invisible memories and affects constructed by “being in the world” are reactivated, presented to one’s consciousness, and reflected upon in a phenomenological manner. Simultaneously, the ties between a singular individual in the world and the community are revealed as a condition of being. Here lies her thorough dismantling of invisible borders. If this work is well received in a wide international context, both Western and pan-Asian, it might be because a common perspective on the body-mind relationship and of the aesthetic of everyday life has emerged since the 20th century, that reunites Western and Eastern perspectives. This article discusses Shilpa Gupta’s work with the help of Western thinkers but could have also considered Indian, Japanese and Chinese perspectives on “everyday life” and their understanding of the relationships between the individual and the environment.83 This common interest in “becoming aware” of the rhythm of the body and its relationship to the space will provide further nuance and enrich the understanding of Gupta’s works.